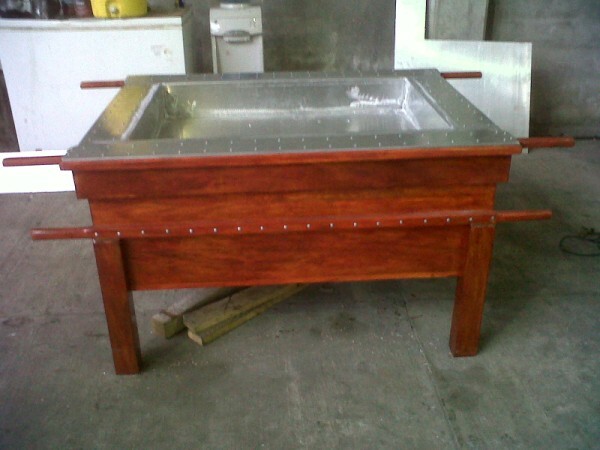 If any of you are familiar with the popular La Caja China pig roasters, I have a friend who has spent a great amount of time designing his own. 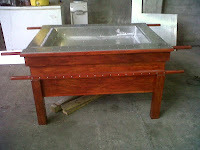 His first design used a kitchen sink for the fire box. He choose the sink method for a couple of reasons. The first, thats what he had lying around. Second, he wanted to show people that you could make a pig roaster with parts lying around the yard. I have never used one of these before but i have seen Mr. Bobby Flay use one in a throw down. The mechanics behind the device is quite simple. Load the pig into the wooden box, cover with the lid, place lit charcoal and wood in the provided firebox, roast your pig. Thats it. Pretty simple eh? Well.. it is. haha. Ok, enough with my ramblings, let me get to the point. Chris, who operates and runs the website known as Cajun Microwave Plans, does just this. He creates the plans and sales them for a VERY sweet deal on his site. He has the materials listed on his site as well. He has spent alot of time and hard work creating these plans. Drop into his site and see the awesome pictures. All he asks of us readers, including myself..."is that you help by contributing pictures and modification ideas so that I can post that information for others." So take it from me and go to his site. Please, what ever is good on this green earth. Go say hi to Chris and let him know you are interested.